Fayette County Schools Superintendent Terry George speaks to an AFT-Fayette County group about the state’s omnibus education bill proposed by the West Virginia Senate in Fayetteville Monday. 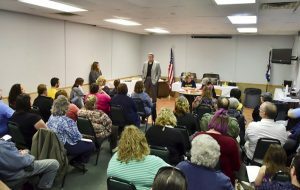 FAYETTEVILLE, W.Va. — During an American Federation of Teachers-Fayette County meeting Monday, union representatives encouraged teachers and school service personnel to contact their House of Delegate representatives to express their concerns about the omnibus education bill that passed Monday afternoon in the West Virginia Senate. Fayette County Superintendent Terry George said although he wasn’t happy the Senate passed the bill, he’s asking those in his county to follow some simple practices. “Be persistent. Contact your legislators. Urge them to look at this bill in separate components, not one large bill,” George said.